Day 1, orientation, getting settled, and adjusting to the heat. 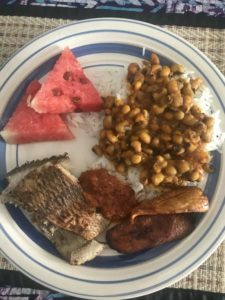 Because the food is so good it is worth of a photo…fresh tilapia, beans and rice, plantains and watermelon. The gang, for now…with Makafui, the director. Happy Easter! Although I can’t see any of the celebrations from our house, I started hearing the music when I woke up this morning, around 6:00. It’s always tough the first night in a new place… getting used to the bed, the mosquito netting, the constant whir of the fan, that is about as close to the bed as I could get it, and of course there’s that heat and humidity, which according to the locals is “nothing” as they all have been talking about how nice and pleasant it’s been. If that’s the case, I hope it stays this “nice and pleasant” because hot would really be tough! I slept well and hard and woke up to a mixture of roosters, singing (I’m guessing Easter celebrations) and my fan. I don’t think it will take me long at all so settle into my life here. I dreamt I was at laying on a beach and the waves were rolling in over me while I slept. When I woke up, I realized that my mosquito netting and the fan blowing on it had lent themselves nicely for the ocean wave dreams. Malaria is a serious problem in Ghana, so I’m thankful to have the netting as an extra defense, along with my daily malaria pill. 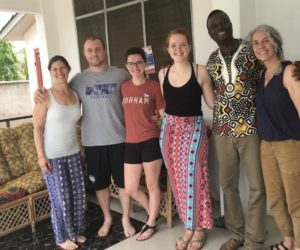 Our program director, Makafui, came by late morning for an informal orientation for the 3 new volunteers (my roommate has already been here 2 weeks, so all total there are 4 of us and hopefully 5 soon, when Lynette arrives). Given that this is my 4th volunteer trip with this organization and my 2nd time with the vision testing, it was really more about getting to know Makafui, as well as his own personal tidbits regarding this region, for me. While giving us a rundown on the house, it was mentioned that the electricity goes out often and on cue, at that very moment, of course, we lost electricity. Once the fans have stopped, you realize how much the moving air helps with the heat. It was back on within 15 or 20 minutes. Makafui went to school in the US, and of all places for someone who is used to the heat, it was in Fargo, ND, so he has a handle of many things American, including slang, that one wouldn’t have unless they had lived in the states. He told us that he was as freaked out by the threat of flu in the US as we are with malaria here, which on a side note is the leading cause of death in Africa. Of course we’re freaked out! He said it’s really nothing and most here have it a few times a year… but that flu! That’s what’s really scary! The deaths happen to those who aren’t able to get treatment, which he said is just a quick trip to the store for the pills. Sorry. I’m still cautiously afraid. He did say that the mosquitoes have gotten very smart and have learned that at night, when you’re sleeping, is the best time for them to perform their “operations”, hence the mosquito netting. Again, any defenses against malaria are well received for me. Oh but that flu! Stay away from that flu! The right hand/left hand and which one does which came up (thanks, Ado, for the reminder during our flight yesterday) and I learned today that the protocol extends to waving as well. Left-handers are kind of getting screwed on this, with that extra step of moving objects away from your dominant hand and into your “working” hand. (Note to two thirds of my kids if they ever come to Ghana…. – People from Ghana do not need much personal space, and like to get as close as they can to you when engaged in conversation. Ado, and his lack of respect for the boundary wall of the arm rest on our 10 hour flight yesterday, makes sense to me now. – Kids are taught never to make eye contact with adults (I’m guessing that their parents would be the exception to this, hopefully, otherwise that “look me in the eye so I can tell if you’re lying” would fail). They see it as a sign of aggression. By the time kids reach adolescence, they unlearn this and handle the eye contact in a similar manner to us. – The community raises the child and corporal punishment is the norm and it’s “““““totally fine if other parents use it on your ill-behaved kids, but it is an embarrassment to the parents of said bad kid as it reflects on skills as a parent. – Marriage proposals are common, to the point that we should probably expect them if working around men, and they’re serious about the proposals! Polygamy is legal under civil law, and does happen, although it’s highly discouraged and is against national law – I’m guessing much like the marijuana laws operate in the US. Easter services are just now wrapping up. 4 hours, at least, in length, as we had someone who will be working with us in the schools next week come by who had just been to the service. She was all dressed up and had a loosely fit white sweater over her skirt and blouse. Meanwhile, I’m in sleeveless and am using a paper towel to wipe the sweat off of my face. The hot season is over as far as they’re concerned. Time for the sweaters. Easter celebrations are church, no egg hunts, with big family and friends picnics tomorrow, which will put off our volunteering time to a Tuesday start as there is no school tomorrow. I’m loving the food, which traditionally is eaten with the hands here. I’m happily obliging, although at this point, I look like the one at the table who is sorely lacking in the manners department! Even with the heat, my appetite is good and I’ve been going through the water like crazy, which is bottled and plentiful. We’re guessing it’s something in the way the food is seasoned. At least I’m not alone. I learned a lot while sitting on the tarmac on a rainy day at JFK. Thanks, Ado. Whatever it was that had me so enamored in my very first cultural anthropology class that I decided to major in the field that I only recently realized even existed, is alive and well and seems to come to life every time my passport is pulled out to be stamped. This was the thought that came to me over and over again while sitting at the boarding gate at JFK for Accra, Ghana. Although I had good headphones with me, so good that they block out all surrounding sounds, I chose to leave them in my pack and instead simply enjoy the music of the different dialects that surrounded me. It was almost melodic and more than once I caught myself staring like a small child who doesn’t yet have a grasp of socially acceptable norms. Staring, likely with my mouth dropped open, isn’t one of them. The competing perfumes and strong aftershave smells, mixed in with the melodic sounds of languages that weren’t even remotely familiar (ironically, English is their first language, but it was conspicuously absent) and the beautiful children, mostly boys, made me smile and totally entertained me for the 3 hour wait I had. I remember this happening when my daughter, Emery, and I went to Peru for the first time and sat at the gate waiting for our flight, in an area surrounded by Peruvians. I was captivated! Maybe it’s a throwback to the many cultural anthropology classes I took, or maybe I’m just nosey, but I would take this sort of entertainment, hands down, over any of the several movies I downloaded to watch, just for this very time gap situation. It was a full flight with the exception of one empty seat and that seat was right next to me. My travel buddy, Lynette, who I met while volunteering in Greece, was supposed to be in that seat, but a sudden onset of what sounded like the flu, kept her in Atlanta, which was such a disappointment to us both, but hopefully it’s just a postponed trip and not a cancelled one. So my journey continued solo. I was disappointed to see that eventually the seat was filled, last minute, so gave up thoughts of legs getting to be stretched out as well as a landing spot for the two carryons that seem so big once tucked into the tiny airline seat space. I can say now, after 2 hours on the ground and 9 in the air, that I feel grateful to have a seatmate, and even more so that it was him, who at this point has no name. He continued to advise me about the left hand and its job description, not in an authoritative way, but rather out of concern and I accepted his words with the intention that they were presented to me. That annoyance of an empty seat getting filled changed to gratitude for what I was guessing at that point would be someone who would be a nice resource for the next 10 hours for any Ghanaian cultural questions that may come up. And they did. While taxiing, he lowered his tray table, nudged me to lower mine and it must have been my puzzled look that prompted his explaination. Of course after his came down, I noticed that every one in the center aisle followed suit and put their tray tables down as well. The flight attendant, rushed over, insisting that the tables go UP, not DOWN, which everyone complied nicely with as we continued our way down the taxiway. He asked me if he could get up and go to the bathroom, still taxiing, and I looked him with a cocked head and furrowed brow and said, NO. You can’t. We’re taxiing. I’m not going to tell this grown man next to me if he can or can’t get up and go to the bathroom so I just shrugged and told him he was on his own. The flight attendant tried to stop him, but without any hostility or harsh words, he simply stated how he really had to go and continued on. This is the only non-stop flight to Accra, Ghana from the states, so no doubt this is not a first for the airline employees. Once the food and beverage cart came around, seatmate without a name, asked for the non-alcoholic wine to accompany his dinner and the flight attendant looked at him puzzled, then at me ( I had requested the wine with alcohol) then with a shrug gave him an orange juice. He saw my wine and then asked for one like mine. And he proceeded to have 3 more. Everything I have read about Ghana and its people speaks of their friendly attitude. He confirmed that with me. I told him it felt like all the passengers, with the exception of me, seemed to know one another. He said not really, but they all know they are from the same country and the different dialects seemed to congregate, although English is their first language. Seatmate also didn’t seem to have a handle on how to latch the bathroom door shut, or maybe didn’t even think it was a necessary thing to do, so unbeknownst to him, when I saw the vacant, not knowing he was in there, I pushed the door open only to see the back of his acid washed jean jacket. I quickly scooted my way out of the area although honestly I don’t think he had any idea I had opened the door. The 2nd bathroom I approached also had a vacant sign, also with a person in it, but it was a woman and she faced out. I’m guessing the whole lock the bathroom door may not be a thing in Ghana. I’m really struck by the crowd on this plane. The children, all boys for some reason, are in clip on ties, white shirts and jackets that still have a few more years of growing room in them. The man behind me was in a black crushed velour jacket, a white tuxedo shirt with French cuffs and cuff links and short black pointy boots decorated with silver studs. The women are dolled up and dressed up like they were headed to a cocktail party. I love it. And in my camo pants, with my pale skin and hair that seems neon bright against all the black hair around me, I’m feeling a bit out of sorts, like I need to add some beads or fluff my hair up a bit. I felt unexotic and too white. When we landed, the whole plane burst into a loud roar of applause. That was truly a first for me. Ado, (my seatmate now has a name), said that the applause is for God for getting us from NY then across the very big ocean and back down again safely. I enjoyed what ended up being 13 hours with Ado (4 of those hours on the tarmac waiting) and found him to be a lovely introduction to Ghana. He’s very proud of his country and told me countless times that I will love it. 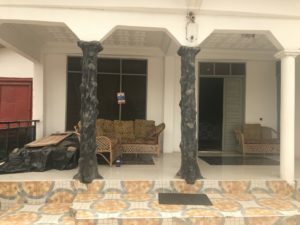 He said he has a very good job in NY and makes far more money than he ever could in Ghana – almost $3,000 a month and although his apartment is expensive ($1,500 a month because he needs a large one with 2 bedrooms because he has FOUR kids), he still has a lot of money left to send home to Ghana. He’s a good man. An hour an a half waiting for bags, which I have to say has to be due to the size of most of them. Almost all of them had the “HEAVY” tag attached and several were the size of small armoires. No doubt hoisting them out of the luggage hold was no easy task! This was followed by a 4 hour drive on very bumpy roads to get to the house where I’ll be staying for the next 2 weeks. I was exhausted and was able to sleep for a bit of the ride, but honestly thought I’d crack a tooth with the way my teeth rattled with every bump, so gave up on the sleeping. The other 2 in the van are a couple from North Carolina and naturally, I asked if they were Duke fans. He very excitedly answered, YES! but felt a huge relief to be away from that depressing loss for at least a few weeks. Then I told him I’m a KU graduate….. The drive took us through poverty like I had never seen before, truly jaw dropping, but I’ll share more about that in later posts. Right now, I’m situated in my room, bottom bunk, under the mosquitoe netting, and just downed my 3rd dose of malaria pills. This already feels far different from anything I’ve ever done. Oh, and it’s hot. Very hot. I have a fan near my bed, which helps tremendously. I’m going to try not to complain too much about the heat, but today’s day one. It’s a free space. I. feel honored to be able to dip into this culture and learn more… about Ghana, about its people, about myself. These journeys truly fill my soul and make me smile. This seems like as good a place as any to insert my disclaimer for spelling, punctuation, bad grammar and simply things that don’t make sense. I think I slept 45 minutes last night. My cozy nest (there are 3 more in the room, but only one roommate, so far) for the next few weeks. The sign was wrapped in saran wrap, to protect it from the elements, but I’m not sure it’s going to help find kitty. No. I didn’t lose my cat. I don’t even have a cat, but while walking into the grocery store a few weeks ago, this sign struck me so much that I decided I needed a photo of it on my way out. I hope the owners of the cat haven’t lost hope and better yet, have had their lost cat returned to them and forgot the small detail of removing the sign. It’s hard to lose things, especially things dear to you, and even worse when those things aren’t ever found. My brother-in-law’s philosophy on losing stuff is that when you find it, you’ll love it even more than before losing it. I’ve tested this theory, multiple times, and its valid. It also has you keeping just a little better track of those lost and now found items, partly because you love them even more now that they’ve been found. So as I wandered through the grocery store where I saw this sign, I couldn’t get the “lost” part off my mind. I seem to be spending more and more time these days looking for lost things and although I know a very big part of this is simply that I’m not present and am doing more than one thing at a time. I suppose age is most likely a factor, then again, this behavior began when I started having kids, so age doesn’t get all of the credit. Distraction and multitasking are the perfect environment for stuff to get lost. I do too many things at once, a holdover from a time when I had 3 kids under the age of 5. My Mom once found a full cup of coffee in my linen closet. No doubt I was talking on the phone, nursing a baby or putting towels away when the coffee went missing, most likely all three. Full cups of coffee are easy to replace. Treasures, not so much. I guess it only seems like it’s the treasures we lose because honestly, who cares about the other stuff, unless it’s something you don’t care all that much about but vitally need – car keys, driver’s licenses, the charger to your phone. It’s the good lost stuff that gets search energy and although much of it I know is probably lost forever, I still find myself randomly looking under the bed or through coat pockets, always with hope. My Patagonia hat. 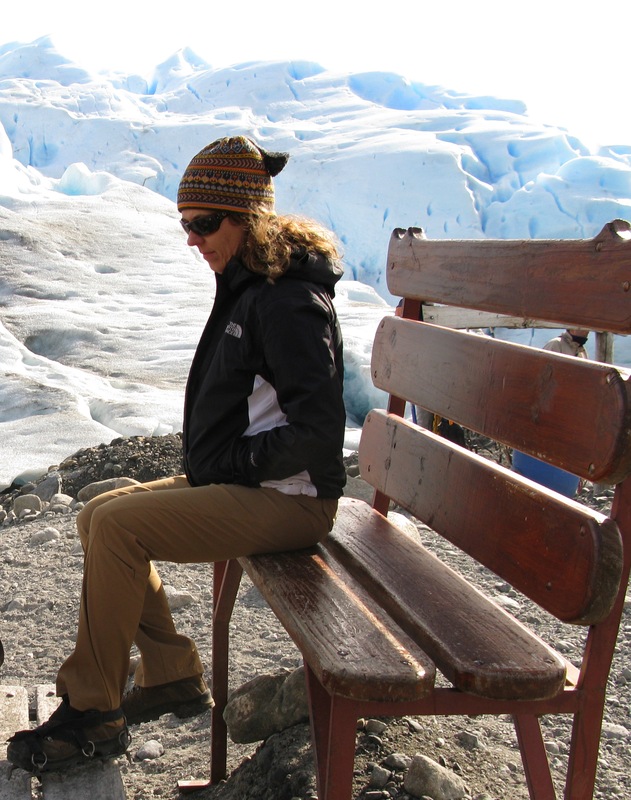 The hat I actually bought in the El Calafate airport in Patagonia when I realized it was going to be colder than I had anticipated. It’s not a color I would have ever bought, but it fit and instantly became a favorite. I wore that hat for 4 years and then it was gone. I actually wore it to bed when I had a bout with the flu, not because my head was cold, but because it made me feel better. When I realized it was gone, I retraced my steps, not many as I was sick and only left the house once, but had no success. I ended up having to make up my own happy ending for the hat to give me the needed resolve. I took it off when I got into my car in the store parking lot and it fell out as I was shuffling bags of groceries. Someone who did not have a hat on that cold winter day found it and has been wearing it ever since. That story makes me happy, but I still miss my hat. I’m sure I could find another just as great, just as warm, just as wonderful Patagonia replacement hat, but honestly, I’ve not even looked. It wouldn’t have come from the gift shop at the airport in El Calafate, and that’s the part that makes me sad. Getting ready for a glacial hike in my now lost hat. My ring. My silver ring with the Peruvian symbol of Mother Earth on its long rectangular front. Gone. And probably never to be found, but I can’t say that I have lost all hope on that one. It disappeared after I was at an out of town wedding and for years I insisted it was in the back seat of my son’s car (who drove to the wedding). He insisted it wasn’t. The car was sold last year and he insured me that he did a thorough check before letting go of it. I’m sure he did. I had been in his car several times since the ring went missing and every time I was in the back seat, he’d remind me that it wasn’t there after seeing me subtly digging my hand down between the seats. So with the car possibility out, my only other sliver of hope was attached to either my washing machine or the dryer, thinking that maybe I had left it in a jeans pocket when doing the laundry. I got my answer on the washing machine when I had to have it serviced and the serviceman told me he had found some things in my washing machines mechanism, which was the cause of the malfunction. I held my breath with anticipation. Four rusted pennies, a bobby pin, and a hunk of something gross that I actually dug through with a screw driver before it was disposed of, but sadly, no ring. Ironically, my now son-in-law was living in Cusco, Perú at the time and I gave serious thought to directing him to the very store where it was purchased to inquire about another one for me, but I didn’t know my ring size and it was starting to feel a bit like a wild goose chase. Besides, would a replacement really fill the bill? I’m not sure. I’ve emptied drawers, moved furniture, gone deep underneath my car seats with a flash light (a word of caution on that one – there’s some scary stuff under there) and have resorted to my Catholic friend’s advice of calling on Saint Anthony for help, but I still have a handful of treasures that remain on the missing list. I just finished reading a book about a man who collects lost things (most bordering on trash) and makes up stories about their history and how they became lost. It was creatively clever and creepy at the same time, especially that he had a room in his house where he stored all of the lost “treasures.” Reading that book had me wondering where exactly my things have ended up. Did someone pick up my ring and wonder what in the world that was on the from of it and where it came from? I guess my hat was kind of self explanatory. 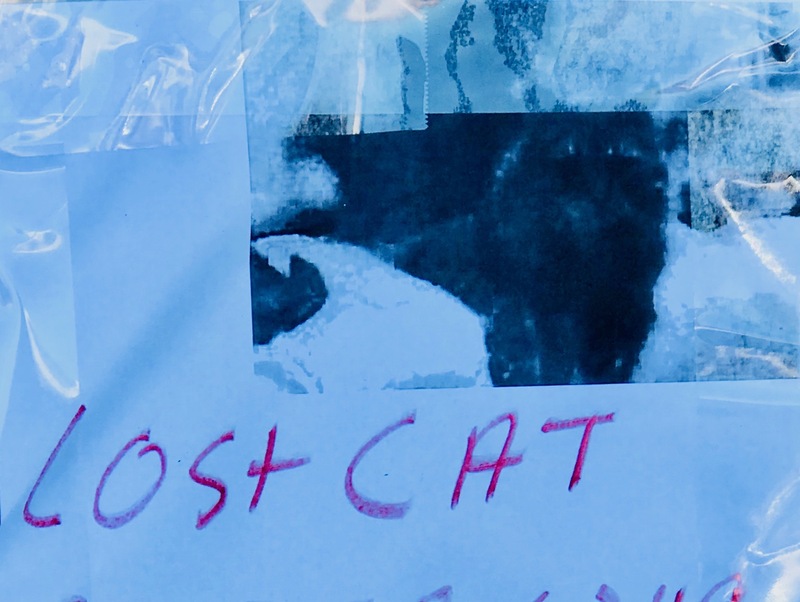 The best way for me to deal with what seems to be a growing list of lost treasures is to simply let them go and move on and hope they have all found a nice home, but then I see a lost cat sign and rings and hats and even a lost coat come to mind as I fill my cart with groceries. Included in the lost item searches and the incredible amount of time I have wasted looking for them, ( my phone being the current champ), I have to include in that time sucking list the many things I’ve looked for that don’t exist. Case in point, one of my favorite Christmas wreaths. After wasting a lot of time digging through Christmas boxes while muttering…”who loses their Christmas wreath??? ?”, I remembered. 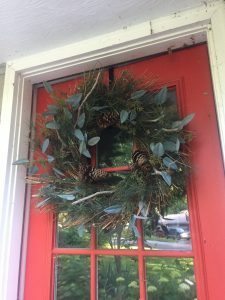 My wreath became a nest and the home for a growing family of robins early last spring. Those kind of finds feel good. Case solved. Move on and go buy a replacement. Or there’s the time I spent far too much time looking for a bracelet that I had forgotten I had given to my sister. Again. Case solved. Move on. 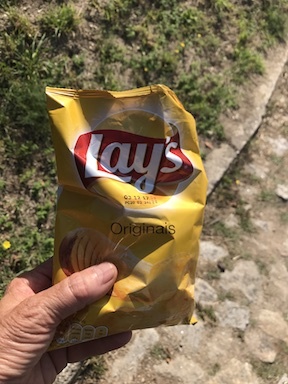 My sister, Susan, can attest to the amount of time and energy I dedicated to items I “lost” while on the Camino, only to be found moments later in the bottom of my pack. It seems impossible to lose something when you only had a dozen or so items you were traveling with, but it happened and far too often. 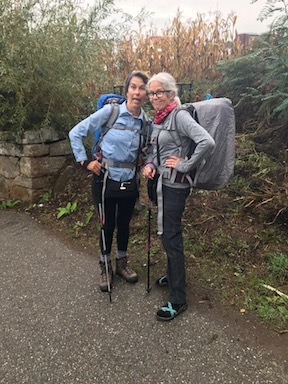 On one of our last days of walking the Camino, when that lost item was my passport, I realized from her frustrations with me that this was indeed something that happened far too often especially given that none of those “lost” items were even lost at all. By the way, after finding my passport, which wasn’t at the bottom of my pack, but rather on the counter at the pilgrim office in Santiago, I came to love it even more and take far more care with it than I used to. On the flip side of the lost of course are the found and is it possible that if the finds outnumber the losts, the lost will remain lost? You know, karma-wise? Many years ago, when I was living in Phoenix, my sister, Robin, and I found a lock box (unlocked) in a small storage shed behind our apartment unit. It clearly had belonged to previous tenants and was accidentally left behind and from the age of it, it looks like it could have been several tenants ago. We checked in with the manager of the apartment complex and she said it was ours now. The box was filled with sterling silver souvenir spoons; a collection that included most of the states, along with some random ones from other countries. At a time when we were both living paycheck to paycheck, often coming up short, that, and the high price of silver at the time, were the perfect combination and honestly, a dream come true for the both of us. As much as I wanted to keep the beautiful set, neither one of us really could afford that option and so I started shopping around Phoenix for the highest bidder. As I recall, the spoons brought around $300, but it felt like thousands at the time when funds were so very tight for the both of us. My only regret is that I didn’t save one of spoons, perhaps the Arizona one, simply for the memory. I’ve often wondered, while looking for my own cherished items, if the owner of those spoons ever wondered what happened to them? Did he/she give up on the search or did they simply forget about them? If I could, I’d reassure that previous owner that the spoons were sold to the owner of a very nice antique shop in downtown Phoenix. I chose his shop over several others because he had a number tattooed on his forearm arm and when he saw me looking over at his rolled up sleeve, he offered me a chair and shared his story with me. Even the memory of that day seems so random to me — sitting in an antique store in downtown Phoenix, selling found souvenir spoons to a Holocaust survivor with a story to tell me. The spoons ended up in a much better place than a metal storage locker behind a garden apartment. Those spoons became the proceeds that bought my airline ticket to the next place I called home in Alaska. So if karma hasn’t quite evened out on the lost and found in my life, that’s OK. Maybe the ring and the hat are like my souvenir spoons and are helping someone else out. Oh, and the cat? Well, the sign is no longer hanging on the door of my grocery store, so I’m going to assume that there was a happy ending. I’m also concluding that its owners love their cat even more now that it’s been found, because that’s how it always works. 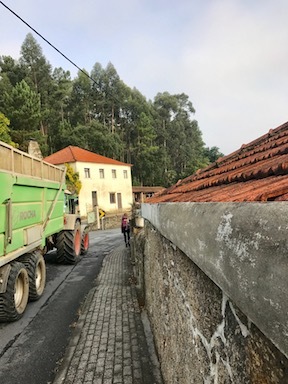 My final wrap up for the Portuguese Camino and the whys behind the delay. This is not a good place to be walking…. This is a very good place to be walking! 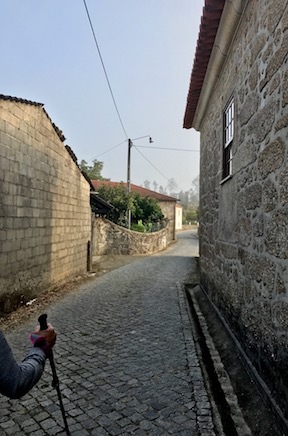 I’ve been home from my Portuguese Camino adventure for a long time, close to 4 months, but have been slow in my final wrap up post, which I can’t dismiss with claims of being too busy or uninspired. Honestly, re-entries from big trips like the Camino, have become the hardest part of the journey for me and although my life returned to a normal quite a while ago, until I put my final thoughts into words, it feels like a little piece of me is still there. And therein lies my excuse. I guess I wasn’t quite ready to add the final period and close that chapter. This post trip, slow re-entry behavior isn’t new for me, although recently I’ve started taking notice of it as there definitely seems to be a pattern going on here, starting after my volunteer trip to Perú in 2009. I realize that this is my wrap up post to a Portuguese trip, not a Peruvian one, but I feel like I’ve got to lay some ground work as to the beginnings of this odd re-entry pattern of mine. So, here goes…. When I got home from my time in Perú, I fell into the strange habit of getting up in the middle of the night, wandering into my closet, putting on a heavy sweater, then crawling back into my bed. I was in a dream-like state when I’d do this so was always surprised the next morning to see that once again, I had added unnecessary layers. It wasn’t because I was cold, but rather, I wasn’t hot enough. It was very hot when I was in Perú, and those who know me well, know that I don’t love the heat. So, in my nocturnal wanderings, I was trying to recreate what I had felt in Perú, at least as far as my physical body was concerned. This was the beginning of a pattern that has repeated itself with every big trip I’ve taken since, in one form or another. My time in Perú was spent volunteering at a center for the poor and or abused elderly in a suburb outside of Lima. Many of the women I friended were originally from the mountainous regions of Perú, a much different climate from the coastal region where they now lived. Regardless that they were in a climate that often rose into the high 90’s in the summer, they continued to wear the clothing they had worn in the mountain climate, still, several decades later. That, and a genuine fear of being cold for health and cultural reasons, had them dressing in multiple layers of sweaters and something I certainly had never seen before, 2 or even 3 long, wool skirts. It’s just what they did and it became what I did as well, post trip. This odd behavior continued off and on for a few weeks and when it finally stopped, so did my dreams of being back in Perú. I was relieved and sad at the same time. 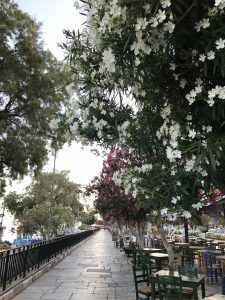 There were many other trips after Perú that had this kind of effect on me, but none as much as my trip to Greece to volunteer in a Syrian refugee camp last summer. Upon my return home, for several nights, I’d dream that I was in the camps, only not as a volunteer, but rather as a refugee. The same people I volunteered with were in my dreams, but they didn’t seem to know who I was and as they’d all leave at the end of the day, I’d try to explain to anyone who would listen to me that I was one of THEM and not a refugee. Of course in typical dream frustration, I had a difficult time speaking and when I finally would find the words, they were never in the right language. My psyche was working overtime and felt the need to tie up some loose ends with me before filing the experience away. For weeks, I would wake up in the middle of the night with my heart pounding and out of breath. The not being heard, or understood was very real. I was beginning to understanding a tiny bit of what the refugees were experiencing each and every day, by living out a small montage of it in my dreams. Those nights were difficult and long for me, but ended up being the punctuation point on my experience. 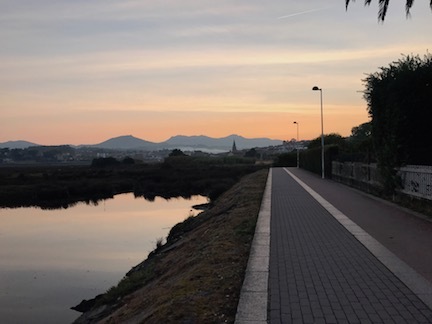 My past two times walking the Camino, brought me the same type of experience in my dreams after returning home, and this past fall after was no different. I would pace myself around parts of Portugal and Spain each and every night in my sleep, but never seemed to make any headway as I was either walking in circles or totally lost. I’d wake up exhausted. So although I had been home for a a few weeks, I had hardly closed the books on the trip, or at least in my dreams I hadn’t. It was a tiring re-entry. I think my psyche needs a vacation. Without me. I’ve learned after my time on the Camino that it is a journey not only of the physical body, but of the heart and soul as well. The physical body takes the lead during the journey itself, and the heart and soul, though never far behind, are more of a 2nd act situation – continually making their presence known long after the boots are off and the packs are put away. It really is the journey that keeps on giving. 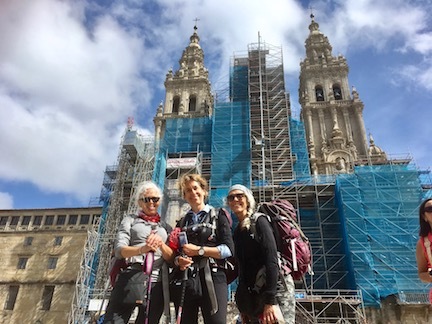 That’s not to say that other travel experiences don’t stay with me and present themselves as a thought or a memory later on in time, but the Camino feels different for some reason. The miles logged will still present themselves when I’m finding myself in a struggle. They remind me of what I can do, whether on an emotional or physical level, and give me the confidence to trudge ahead. They became the metaphor to the bigger picture of my life, one step at a time. I have to give credit to my physical body during that journey, who worked very hard and hung in there when my mental body was quietly chanting, “I can’t do it. I can’t do it. I can’t do it.” It walked on boardwalks, dirt, cobblestones ( a lot of that), tile, sand, more cobblestones, highway shoulders, grass and rocks. It wore sink-washed clothes that underwent a ritual of being washed every few nights, which seemed to give me more peace of mind than actual clean clothes. It put on not yet dry underwear under not clean pants because it was raining outside and the laundry hanging out the window didn’t fare well in those conditions nor did it dry when hanging off the pack with safety pins. It went weeks without washing its hair, wore the same socks for longer than I care to admit, drank water from a camelback mouthpiece that I realized weeks in had been dragging the ground every time I set it down, wherever that may be, and then was promptly picked up and put in my mouth to hydrate. It ate potato chips for dinner, peeled breading off of fish to eat the insides only (I’m gluten sensitive…yeah, try that in bread loving’ Spain and Portugal!) and went to bed hungry. Thank you, body. Thank you for keeping me whole. Yet again. Those potato chips…. Once again, one of the lessons learned on the Camino was that I have far more fuel in the tank than I even begin to tap into. I learned that last year on the Camino, and the year before but continually forgot it until at the end of a very long day when I didn’t feel like I could even make it up to the check in counter at the hotel. A quick shower and a legs up the wall recovery and I honestly would feel 100% ready to go and as if the last 8 hours had not been spent walking with 20 plus pounds on my back. Recovery is quick and truly amazing and thankfully, it’s not only the physical body that can show such resilience but the emotional body as well. Well done body team. Thank you. We spent more time on this Camino being lost, but not in an “oh no, we’re lost….now what?” but rather in a “well I don’t think this is the right way, but that restaurant ahead looks like it has a nice view” kind of way. That’s not to say we didn’t have our frustrations. Day two was the most challenging of all of our Camino walks combined, much of it on a busy two-lane road with blind curves and a very narrow shoulder that was hemmed in by a knee high stone wall. That, thankfully, did not last long. We stopped at the first cafe we could find, tried to communicate about the route and what was ahead with the only customers there, who unfortunately all spoke Portuguese. Lucky for us, the one late to the table just happened to be French. Susan was able to get us sorted out in French, while in this small, Portuguese-speaking town because my Spanish wasn’t making any headway. Team work and some luck, just when we needed it. 10 minutes later we were in a cab on our way to our hotel. Thoughts of “are we cheating?” kept coming to mind, but as far as milage goes, we had already put in a full day of walking milage-wise, mostly in circles, mostly by 11:00 am. So no. There was no cheating involved that day. 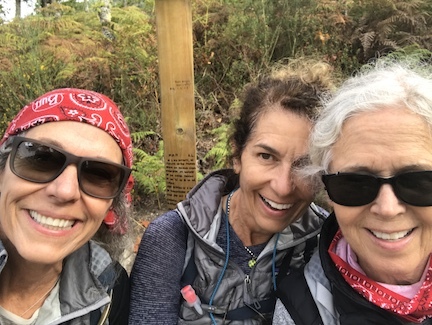 When it’s your sisters you’re traveling with, you can be totally honest, whether that means fessing up to exhaustion rather than muscling through it and punctuating it with complaints of a pack that is too heavy. There’s no needing to compete to be the strongest, the most energetic or even the cleanest for that matter, because I was with my sisters and I could speak with pure honesty. After 3 weeks of walking together, averaging around 8 hours a day, that open honesty was truly was a gift. “Oh and by the way that hunk of whatever it is in-between your teeth? It has been there all day.” Freeing. Easy. Sister-speak. We rediscovered the odd phenomena of physical body time officially not starting until the sun comes up, which meant that if you walked 2 hours pre-dawn using the light of your headlamp to light the way, it was almost as if those 5 or 6 miles you covered were given to you without any physical effort. The body only seemed to start tuning into the miles once the sun was up and it could clearly see what was going on. I know. Crazy. It absolutely made no sense at all but it was a sure thing that Susan and I discovered last year during our longest days on the Camino. I also found this phenomena to translate into the road trip arena when my daughter, grandson and I made a road trip from Ft. Collins to Santa Fe. We left 2 hours pre-dawn and honestly, the tiredness, the hunger, the boredom, the are we almost there?, were magically postponed by at least two hours. Again, whether walking or driving, the efforts don’t seem to start tallying up until the sun comes up. Besides, there’s that wonderful perk of seeing a sunrise, something that every single time I see, I question why I don’t see it more often because seriously, it happens every, single day and is quite the gift. The scenery was spectacular, the people warm and friendly and the time spent creating memories with both sisters, priceless. We each logged difficult days, fortunately none of them at the same time, giving us ample opportunity to rally around the weakest as needed. There can be two days of the exact same physical skill, but one day will beat you up and the other feels like a walk in the park. I’ve no explanation for that short of your mental state when the day begins. There was plenty of time for pity parties and we each took our turn when we needed it. Mine was about mid-way through our journey on a long, hot day, a few miles outside of our destination town. I was tired, annoyed that we were still walking, and wanting my pack and boots OFF. Of course once you’ve hit that mind set, it’s very hard to claw your way out. Susan recognized the behavior and stopped and waited for me in front of a small store. As I caught up to her, she handed me a package of Lays potato chips. She knows. Sisters know. Robin’s day came in a pharmacy trying to find a cure for a pretty bad sun rash she had started developing on the back of her legs. Robin tried to explain to the pharmacist what was going on and rather than struggle with descriptions and fight a language barrier, the pharmacist came around the counter to have a look. When Robin pulled her pant leg up, the pharmacist literally reeled back, took a breath to compose herself then went about the task of finding the proper ointment for the job. It’s possible that Susan and I re-enacted that reeling back motion a few more times than it was necessary. You catch the laughs when you can. They become vitally important. Susan had a toe issue about half way in that presented itself on one of our longest days. Given that we were on rural, remote path in the woods, there was literally nothing that could be done short of continuing to walk while offering up any words of encouragement we could scrounge together, including re-inactments of the pharmacist reeling at the sight of Robin’s leg. We were only as strong as our weakest link on any given day so it was always an all hands on deck in an attempt to scoop up the one who needed anything extra that we had. Those many memories collected became woven into the tapestry that is my life; a tapestry whose pattern is not always predictable, or neat or tidy, or even always pleasing to the eye, but collectively these rows of tattered and wonderfully rich experiences are nothing but beautiful to me. 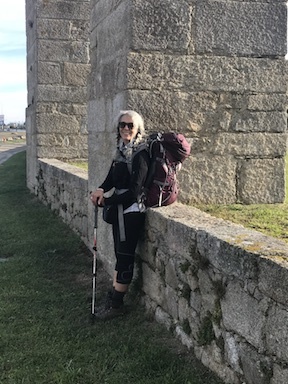 I spent a lot of hours on the Camino, in my head, envisioning myself sitting in a large room with piles of different colors of yarn, weaving each and every travel experience into a tapestry, row by row. It’s a picture I think of often and with great comfort, knowing that each thread of a memory is woven into a greater fabric and not forgotten. As much as the feet were moving during our journey, the mind certainly did its share of wandering as well and long after my return home, I find myself recalling those imagined places such as the large room with the tapestry yarns, just as much as I recall the real ones. Our arrival to the cathedral in Santiago was exciting but truly it was the journey, not the destination, that had the biggest impact. Volunteering in the refugee camps – final thoughts. Nearly one in 100 people have been pushed out of there homes due to political instability or war. 4.9 million Syrians, half of them children, have fled their country and are now refugees. Greece has over 62 refugee camps, housing over 62,000 refugees in total. Although the media coverage on this has dwindled, the crisis is far from being over. I’ve been home from Greece several days, and the question, “How was it?” is still a struggle for me. No matter how much thought or effort I put into finding the right words, they will never be sufficient. That being said, I’ll start with the easiest… the physical descriptions. “How late do you guys sleep anyway??? He told me usually until early to mid afternoon. The reason being, they don’t go to bed until 6:00 or 7:00 in the morning because it’s quieter and cooler in the camp at night. There is very little for the men to do, especially the single men, so boredom and depression have become the norm. There are a handful of tents outside of the warehouse that housed the men who did not care to be around the children. Their tents looked pretty basic, like Army issue, but I was told that that was what they preferred. They pretty much kept to themselves. Ritsona, where I also spent some time doing vision screening, is a camp of approximately 750 residents, who were originally housed in tents but now are all in ISO boxes, or mobile units. They are predominately Syrian and because that they fled a war torn country, they have full refugee status, which allows them to receive help from organizations such as UNICEF or the IRC (International Rescue Committee). Refugees are still coming into both camps and some are leaving to be re-settled in other parts of Europe, although the leaving is happening at a much slower rate. The children seem to have free run of the camp and at a third of a total population of around 600 at Oinofyta, there are quite a few of them. Even kids who are still in diapers are seen wandering around by themselves, finding whatever they can to entertain themselves with. These kids were so independent and creative, out of necessity, that they could entertain themselves for hours with a piece of string if that was all they could find. On one of my last days at Oinofyta, 3 kids hung out with me and entertained themselves for an hour and a half by taking turns spinning each other around in an office chair. That simple. They were a laughing, sweating, shouting trio of joy who moved back and forth between Farsi and English (the English to include me) with unbelievable ease. Kids are kids are kids, sometime regardless of their past, their present or their very unsure future. I marveled at the simplicity, the imagination and the raw joy that these kids were able to indulge in on their own. No coaching, no supervision, no props necessary. Having so little also led to a lot the kids “stealing,” which I’m putting in quotes to soften the word a bit. While I realize that stealing what is not yours is in no way excusable, I can certainly understand where their motivation comes from. Notepads, pens, sunglasses, water bottles and anything else that wasn’t nailed down was at risk of walking out of our space. It became a bit of a game for the kids and often they’d return the item shortly after it had walked out of the door, usually with a coy smile and a hug. The kids gave up everything they had to make the dangerous journey and that need to recoup belongings was ever present. While helping some of the volunteers out with a craft project at the summer camp, this really came into play for me. I had cut up bits of paper to be used to decorate signs and had placed them in piles in the center of a work table while waiting for the kids to join in. The first girl to the table immediate scooped up all the paper bits with her outstretched arms and pulled them towards her, carefully covering them to insure no one else would get any. When I told her she needed to share, she looked me straight in the eye and with an intensity that I hardly thought possibly from this tiny, sweet child, shouted, “NO SHARE!! !” And she meant it with every bit of her 3 feet of being. We solved the problem without tears or tantrums, and as frustrating as incidents like that were, they were also so easy to understand. Part of me wanted to remove the girl from the craft table, step in with some discipline, tell her to think about what she’s done and all that, and the other part of me wanted to give her more paper bits, my shirt, my shoes and whatever else she wanted. 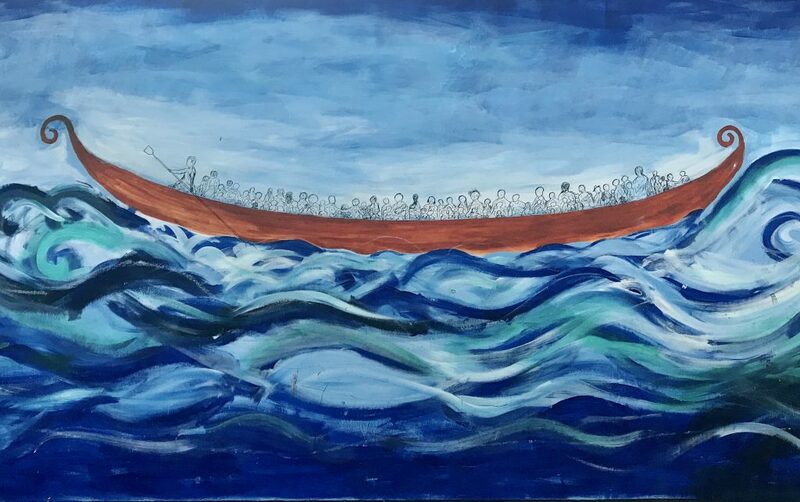 These kids have gone through situations that we can’t even begin to imagine, crossing countries on foot then getting into overly crowded boats to continue the dangerous journeys on water, with many of them having to throw all of their belongings overboard because the boat was sinking with weight. Keeping their entry in mind made frustrations as such seem very trivial. These kids have no boundaries, no structure (short of the a few hours of school in the morning and afternoon camp sessions the volunteers provided) and very little to play with or occupy their time, yet I rarely heard the whining cries of boredom and “there’s nothing to do…” One of the regulars to the vision screening room was a 2 year-old who the residents called “moosha” or “mouse” in Farsi, which was an appropriate nickname for her as she was tiny and quick. She’d wander in, often with a cucumber or a big piece of fruit in hand that she was munching on, looking for something to do but even more so, looking for attention. My last day there, she wandered over to the computer, picked up the mouse and started pretending it was a telephone. She’d hold it to her ear and say “Hello??? Hello?? ?” then would hand it off to me giggling, and I’d do the same. This went on for quite some time. She spoke Farsi and I don’t, but language wasn’t always necessary to communicate. Getting to know some of the faces behind the stories that I had read so much about before hand, of dangerous crossings across countries on foot then across water in overly crowded boats, was humbling to say the least. Conditions in the countries that were fled (in Ritsona, primarily Syria and in Oinofyta, mostly Afghanistan), had to be so horrific that families were willing to put themselves and their family’s lives in incredible danger, only to end up in a psychological and legal state of limbo that has been going on for most for over a year – far longer than any had anticipated. Babies have been born in the camps (27 at Oinofyta to date) who are now walking and talking and are considered stateless – children with no country. Germany, a country that many of the refugees hope to immigrate to, does not automatically grant citizenship to those who were born in the camps, leaving these kids without citizenship to any country. There really was so much heartbreak and frustration that I felt like I became a gatekeeper to a sea of emotions, knowing that there was only so much I could take in for the sake of my own sanity. That process has continued for me, even after settling into my regular routine for the past several days. These refugees are not statistics or headlines or political fodder, but rather, they are real people. They are the sad and hopeless eyes of the mothers who would hold their baby out to me with pride, wanting to know if I wanted to hold him/her. That was especially hard for me when one woman’s baby was the age of my grandson. They are the fathers, who made a point of proudly showing off their English to me with “hellos and how are you?” in English as I passed them in the hallway. They are the sticky hands of the children who would grab my hand, and walk along side me, always desperate for any attention they could get. They are the families, grasping onto whatever hope they can find while days become weeks, and weeks become months and now over a year has passed and still they wait. I was told by so many that they feel forgotten and unwanted. Those were times I was grateful to not speak their language as I had no words to give in response, whether Arabic, Farsi Urdu or English. My first night back, I dreamt I was back at Oinofyta, only not as a volunteer, but rather, as a resident. The volunteers I had worked with for the past 2 weeks didn’t recognize me as part of their group, but instead thought I was a resident. I tried to explain to them who I was, but hard as I’d try, I wasn’t able to speak. I was without a voice and felt I had been forgotten. I woke up in a sweat, out of breath, my heart pounding. The same thing happened again on my 2nd night home, only I seemed to be more accepting of not having a voice, and spent much of my dream wandering up and down the hallways, trying to find the room where I belonged. I’m still struggling nightly in my dreams, which is a pattern with me that started the first time I volunteered in Perú, over 10 years ago. It seems to be part of my processing mechanism and although it does not allow for an easy re-entry, it has become a predictable part of my journey. I really don’t know what these refugees are going through on a daily basis emotionally, physically or spiritually, but for one brief moment during my sleeping hours, my psyche seemed to be trying to give me a small taste of what it feels like to feel totally forgotten and unheard. And for these past few nights, if only in my dreams, it has been terrifying. Since I’ve been home, I feel like I’ve only been present as a physical shell, my emotional system still residing in Greece, not quite ready to join me. This re-entry seems especially difficult for me and maybe that’s the reason why it seems to be taking my heart so long to catch up to my physical body. We are not yet in sync and that’s ok, as this is a process that moves at its own pace, and for that, I’m patient. It would be easy to paint this whole experience with a large brush of sadness, despair and hopelessness, but that wouldn’t be totally accurate. There was joy… on the faces of the children as several volunteers would make their way down the main hallway, led by a song and a guitar, to indicate that it was time for summer camp, Pied Pipper style. This was the highlight of each and every day at Oinofyta and one that makes me smile just thinking about it. The kids and parents as well, would come out of their rooms, smiling and clapping along with the song. Moments like those helped cushion the underlying pain of feeling forgotten and unwanted that has become so much a part of these people’s lives. There is an NGO (non-government organization) that is involved in both Ritsona and Oinofyta camps called “I AM YOU.” I was so struck by that name and how appropriate it was. I AM you, and you ARE me and we have to be in this together for the sake of humanity. Another NGO, and the main one at Oinofyta, is called “Do Your Part.” And so I try. I know that what I do is only a drop in the ocean, but if that drop can send ripples out far enough to open up the heart and mind of even one person, than I’ve done something, not near enough, but something. It will be a long time before I completely process the magnitude of this experience, but for now, as I work through it, those sweet innocent faces of the children and the pained faces of the adults come into focus for me nightly and have claimed a piece of my heart. Yesterday was good… my eye check partner, Tim, and I checked a dozen or so eyes yesterday of children ranging in age from 5 to 18. 2 failed. We had hoped to see a lot more kids but Mohamed said it may take a bit for this new program to catch on. He tried to drum up some “business” for us by going into the living quarters and knocking on doors. Many of the mothers simply said their kids eyes were fine. I’m sure vision problems are not first and foremost on their minds right now. But word eventually got out and we had a bit of a rush at the end of the day. I’m sure as the days go on and more and more find out about it, we’ll get the numbers of 30 screenings a day, which is our goal. Shae and Lynette are next door to us, doing the same thing, also seeing about 12 kids. There are over 300 in Ritsona and the hope is to get most of them screened in the next few weeks then the process will move on to the 18 and older crew. The kids caught on quickly to the process, and we were surprised by how many of them had a grasp of English, though limited, enough to understand the directions the antimatter bear gave them on the computer software (the Arabic language didn’t seem to work so we were stuck with the English, which was just as well as we did have a handful that didn’t speak Arabic either. Only Kurdish, with limited English. I think my biggest takeaway from the day came from watching the behavior of the boys, especially the 8, 9, 10 age group. They were extremely aggressive with one another – throwing rocks, fighting and circling each other in real animal stances to show dominance. I had tested two of them, who Mohamed referred to as the “baddest boys in the camp” and to say they were a handful would be quite an understatement. While I tested one, the other was running around the room, grabbing things, throwing them, taunting me with threats to push different computer buttons etc. I know boys will be boys, I had two at those ages so know the score, but this felt very different to me. They would go from charming, adorable boys to aggression so quickly. Eventually, they left to go join up others in their age group (where volunteers from our group would have the opportunity to corral them…) and two younger (five or six?) boys became the show for us. They would circle one another in acts of dominance then the rock throwing began (much of the ground is rock, much larger than gravel and just the right size it seemed for throwing). They would pick up a rock and reel their arm back as if to throw it at the other boy then slam it onto the ground, almost as if they had gotten caught once and were told never to throw rocks AT someone. When I mentioned it to Mohamed, he pointed to one of the little boys and said, “Him?” When I answered, “Yes,” he told me that only moments earlier he had seen that boy’s mom throw a rock at him out of desperation because he wouldn[t come when she called him. Kids learn. So often throughout the day I had to circle my thought pattern back to the understanding of where these kids, and their parents, have come from and what they have been witness to. These are clearly acts of PTSD . The kids have few boundaries in the type of living situation they are in and seem to wander around the camp without any supervision (I watched two toddlers, pacifiers attached to their clothing, who were climbing on chairs with absolutely no one watching them). It is so hard not to place my own value system on their behavior, which keeps me in constant check of remembering the horrific violence these families have been through, especially the innocent children. They can’t unsee what they have seen or unfeel what they have felt and so such emotions are played out in the aggression I witnessed yesterday. I skipped the group dinner in our “assigned” restaurant last night and had dinner with Lynette and Michelle, two sisters who I’ve really come to enjoy, and we talked about the aggression over dinner (while watching the sun set over the Aegean Sea – had to throw that in…). Michelle works with 5 to 8 year olds and said she saw a 5 or 6 year old boy constantly bullying one of the girls. This isn’t easy. I’ve got to remember the history of where these people have come from and don’t want to paint with too large of a brush here as this kind of behavior and those “baddest boys of camp” were definite the exception, and not the rule. The kids overall were a delight. They are beautiful with their big brown eyes, olive skin and black hair. In addition to our vision screening, we also did BMI scores (height and weight ratios) and many were underweight or very over weight, which no doubt could be attributed to poor nutrition. I have found a nearby coffee shop and my morning routine is to walk there, get a latte, then walk along the boardwalk and watch the sunrise while I relax and contemplate the new day’s arrival. Although not quite the exercise I was getting before with my hour walk around the horseshoe-shaped sea walk, it comes much closer to giving me the gentle start to the day that I need. I feel very safe here in Chalkida and really enjoy the pace of life here. It’s a nice oasis to return to every day. Ritsona Camp – day one. 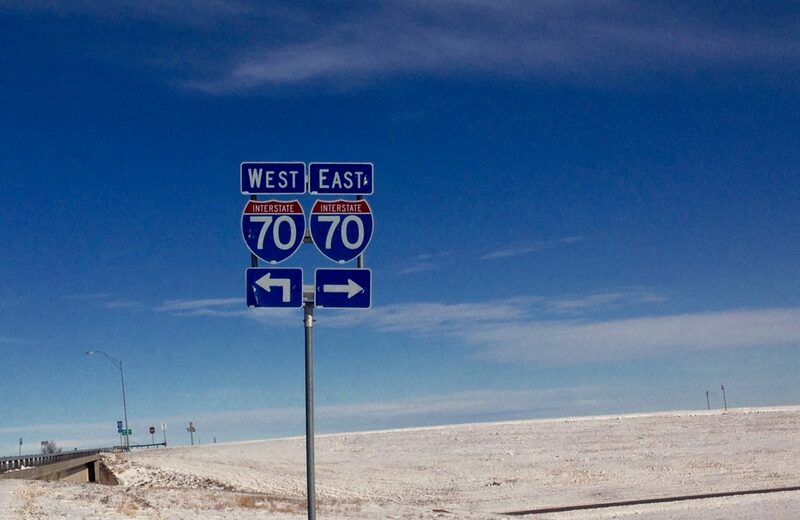 Today I felt like I entered a parallel universe… one I knew was there, but in reality, had no idea. I spent most of the day at Ritsona, the Syrian refugee camp, working with 3 other volunteers on honing our skills with a vision check computer program to test the 300 plus kid’s eyes at the camp beginning tomorrow. We then went to another camp about a half an hour away where we met up with the other 2 in the vision screening program and spent the last few hours sorting and cataloging hundreds of donated glasses (most from the 70’s I might add…). This camp, Oynofyta, is primarily refugees from Pakistan, Afghanistan and Iraq so the languages vary immensely, only adding to the language barrier. The camps are very different (I’ll likely spend a week in each) both in their size and set up. Ritsona is larger, 750 residents (it is suggested that we refer to the refugees as residents, not refugees as it’s far more positive…) who are housed in ISO boxes, or caravans as they refer to them. They look like a small trailer and are placed very close together, two or 3 of them sharing a small kitchen and bath. We aren’t allowed to go into their living area for privacy reasons so only saw them from a distance. The other camp has 500 or so residents who are housed in a large warehouse. Their living spaces are partitioned off by I believe heavy fabric with doors that aren’t much more than shower curtains. Given that they are all under one roof, in very tight quarters, I felt a much greater sense of community in my short time there, with kids running in and out of the room we were working in, desperate for our attention. They are, by the way, adorable, and more than anything, I wanted to scoop them up and just hold onto them as long as I could. Of course we are discouraged from that as some of the parents may object and they already have deep seated separation issues. Still, there were a couple of girls that just loved trying on the big-framed glasses while we laughed and played along with them. I’m not sure the language they spoke (several…as there is such a mixed bag of countries represented) but there is some English. One of the girls asked me if I was Greek and when I told her no, she said well you have clothes on like a Greek. I asked her where she was from and she quickly responded, “Sweeden!” With her olive skin, black hair and dark eyes, I hardly think she was from Sweeden, but my guess is that that is where they are hopeful to be processed. Kids are kids, no matter where they are from and the experiences they have had, and it delighted me to see them being goofy, laughing and simply having fun. 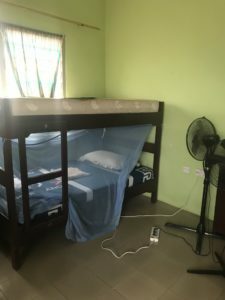 Some of the other volunteers who worked with the older children (mostly boys) did comment on aggression issues, which is not surprising given the tight living conditions they are in and the horrific violence that they have been witness to. I found it hard to let my mind wander to the conditions the kids as well as their parents, came from, but it couln’t escape me and that’s when I became vulnerable to my own emotions. Overall though, it was a very good day and I feel ready to start testing eyes tomorrow! This is a huge project that CCS (the volunteer NGO I’m working with) has undertaken and we are the first ones to use this program. If it works, and if they can procure the necessary funds, this will be an ongoing and growing endeavor throughout the world. I’m so proud to be a part of it! On a side note, my gluten restriction paid off today…. my gluten free lunch was forgotten and although I said no worries, I’ll eat fruit, Mohammed insisted he could do better and the two of us went to a small hut where a man fixed me the most amazing falafel with salad, no bread. I got to sit with the local men and Mohamed, on cushions and absorb it all. Truly, it was the best lunch I’ve had in a long time. I’m reminded at times like those who cultural anthropology spoke to me so much and why it was what I majored in in college. I hope they forget my lunch again today…. I’m onto something much better! 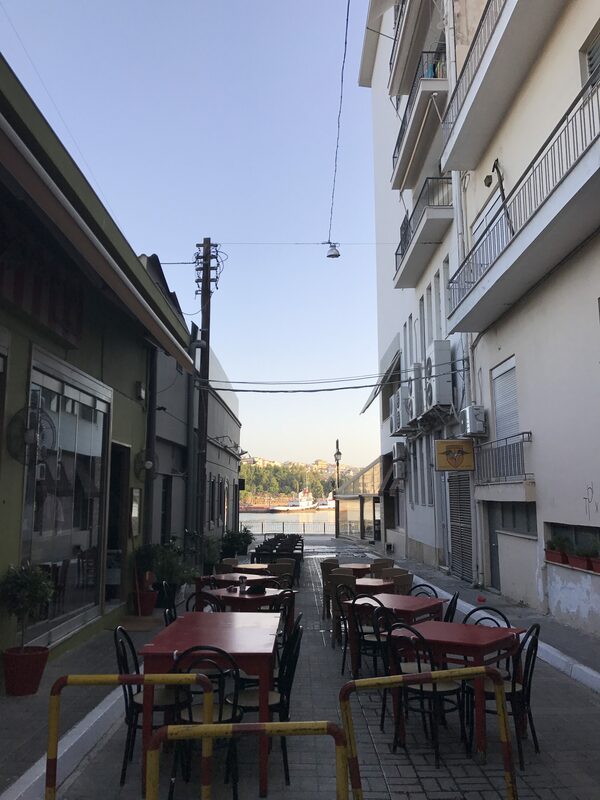 I’ve arrived…Chalkida, Greece. Home for the next 2 weeks. After what seemed like days of travel – KC to Minneapolis to Paris to Athens then an hour drive to Chalkita I have arrived to my home for the next two weeks. It was a shot in the arm to see Mohammed at the airport (Mohammed was the director of the program in Rabat, Morocco, where I volunteered a few years ago). The woman who was seated next to me on the flight from Minneapolis to Paris asked me about my travel plans while we were exiting the plane. I told her and her eyes geared up. She was American but from Israel and was headed there to see her family. She praised my efforts, we said brief goodbyes, then were on our separate ways (we didn’t talk at all during the flight, so it was a rather quick “introduction”). She later caught up with me in the airport as I was finding my way to my next flight, and gave me a hug and wished me a safe journey. That was an encounter that will stay with me. Her gesture meant so much, especially as I’m entering a huge unknown here…. I’m staying in a small hotel a short block from the water. Chalkida is on an island just an hour away from Athens so is a popular vacation spot for the locals. I’ve not yet been to the camp where I’ll be working, but can already say that this spot will feel much like an oasis at the end of every work day. Our room (I’m sharing with a woman from England), is small, but adequate, and “air conditioned”, although I do have to put that word in quotes. It’s hot, exceptionally hot for this area, I’m told, and after today’s projected high of 109, we are supposed to be in for some cooling tomorrow. 90 will never feel better. The camps are totally exposed, no trees, so it will be much worse. There are 25 or so of us, all staying in the same hotel, most from the USA and a few from England. Today will be an orientation day – learning more about the camps as well as our job assignments. I’ll have much more to day tomorrow, no doubt, but so far, I’m feeling content, happy and filled with anticipation…. They left, and I missed it. Is that nest that’s nestled in the back of the wreath still a nest if it’s no longer in use? Or is it just sticks and grass? The babies have left the nest, and I didn’t even see them leave, which makes me sad. And to add to the sadness, I don’t even recognize them any more. My baby robins, not my kids. And yes, I call them “my” baby robins because even though it was just a step stool pushed up to the door and a whole lot of observing while trying to stay hidden from a mother who was scared to death of me, for some reason, I feel like I’ve got some skin in the game and can claim some sort of accolade in their entrance into the world, if only for providing the Christmas wreath for the foundation of their nest. My five baby robins were just days from their first flight, I’m just sure of it, as I saw them begin to flutter their wings while their mama shouted directions from a near by tree. How do I know that’s what she was doing? I don’t. I really have no idea. She could have been yelling at them to tidy up that pig’s sty of a nest or just fly already and start pitching in on the food gathering, but my instincts tell me otherwise. And I missed it. All that time peering into the nest, while watching them get bigger and stronger and begin to open and flutter their tiny wings and I missed it. I missed their very first short flight to the dogwood tree just feet away. Did they all make it? Did they take turns or did they all leave en mass? Was the first one to exit a show off or did he/she help convince the others that it was a good thing and to go for it? 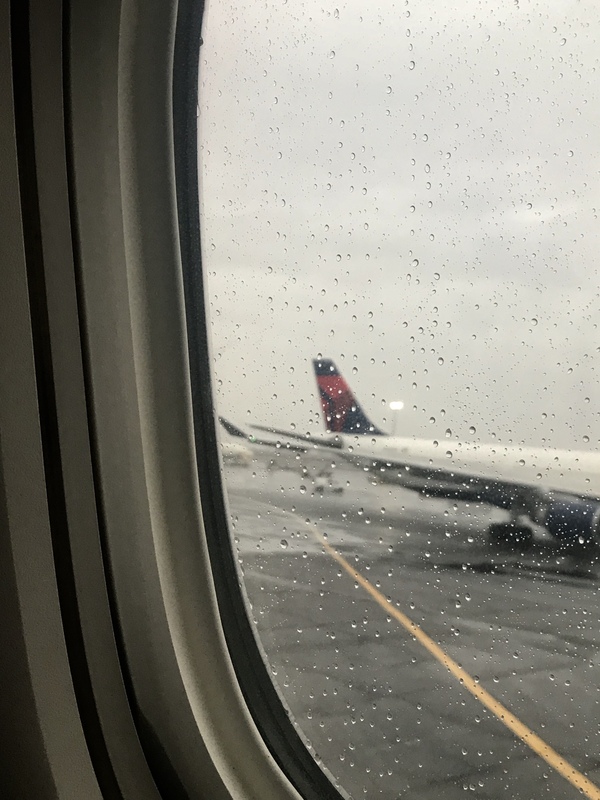 I actually even thought about delaying my trip by a day but snapped myself out of that bad idea as my trip was to be with my daughter who was days away from having her first child! Still, as I watched that morning, and saw fluttering wings, I hesitated, but quickly came around when visions of explaining to my daughter why I missed the birth of my first grandchild because of a nest of 5 robins in my Christmas wreath who were oh so close to their aeronautical debut. Yeah. I made the right decision. Now here I am, 5 weeks later, with a bird poop encrusted back door window, an empty and now rather disheveled nest perched in a Christmas wreath that is still hanging on my door at the end of May. I’ve learned that robins will often return to the same nest more than once, which may be part of the reason I’m hesitating. But a Christmas wreath on my door all summer? The baby birds, the leaving the nest, the instructing mama, all seem so relatable to my own role as a mother. Granted, I was a front and center witness to all 3 of my kid’s exit from the nest, and most likely their driver to take them away, but once they landed in their own nests, I had to rely on faith and good measure that they knew what they were doing and would stay on the side of safe and secure since I was no longer privy to their comings and goings. Metaphorically, for their first 18 years of life, I stood on a stool and watched all 3 of my kids through the window of life as they began to spread their wings, and I knew, as their mother, when to reel them back into the comfort of the nest and when to give them a little push. Again, there was a whole lot of relying on faith and good measure, which I got pretty good at through the years. However, that was tested when my middle child came home from college for the first time and questioned why he needed a curfew because in reality I had no idea what time he came home when he was away and why would it all of a sudden make any difference now? Well played, son, well played, but I got you on a technicality that we never addressed before…. my house, my rules, which really means, I won’t totally go to sleep until I hear the garage door go up and know that you’re home. The hold on tight, let go, grab again while trying to loosen your grip part of parenting is hard – on the hands, on the heart, but we persevere. And although it gets easier with time, it is always a challenge because we watched those babies hatch, grow wings, spread them and fly, and proud as we are as parents for those accomplishments, we still have that urge to call them back to the nest. Birds, babies… I’m grouping them all together on this one. With 3 kids, living in 3 different spots, all at least a good day’s drive away or more, I’ve learned to set aside my worries (well, most of them) and let go as much as I can while trusting them and the decisions they’re making. They are, after all, all adults. Still, I’m their mom and just a tad bit of worrying seems to stick, no matter what. While out working in my yard today, I saw more than one robin and realized that it was possible that I’m no longer able to distinguish the adults from the children. I’m guessing they grow up that quickly. So when I saw that first robin today and a big smile came to my face thinking about the babies in the nest and how far they had all come, I had to stop and rethink the situation. That could have been the mom or the dad or for Pete’s sake, even the uncle or maybe, just maybe, it was one of my 5 baby birds, all grown up and doing exactly what nature intended. I’m not sure what I’m going to do with the nest, I mean wreath, and if I’ll leave it on the door with hopes that I’ll get to do this all over again with another generation of robins, or if I’ll take may chances with a new wreath next Christmas ( and a new one would be in order as this one is not “clean up-able” enough for saving purposes, but a small price to pay for the enjoyment it provided). So, baby birds who likely look like adult birds by now and baby kids of mine who are tall and shave and drive cars and are having babies of their own and hardly look like babies either, you remind me, always, about the cycle of letting go and trusting. My child who just had a baby a little over a month ago, will soon begin to understand this and more relevance may begin to come into play when it comes to baby birds and nests and hovering and protective mamas. At one point, it will begin to not only make sense, but become eerily familiar…the continuous and cyclical nature of life, both beautiful and difficult at the same time. In the meantime, I’m enjoying the many robins in my yard and am pretending to know who they are, or at least the ones I watched so intently from the step stool in my laundry room. If I could get them to make eye contact with me, maybe, just maybe, they’d recognize my face as the one that peered down on their nest, several times a day, through the window of my laundry room door, and whispered words of encouragement and bursts of “you can do it” when I saw the first wings begin to flutter and spread. This. This amazing miracle of nature and life, I have witnessed so often and whether with baby birds or my own children, it never, ever, gets old. Yeah, the wreath is staying. I want them to remember where they came from. Happy Mother’s Day, dear Emery. Welcome to the world, Arlo John Golson. It’s a bit early for my Mother’s Day post, but this mother and very recently, new grandmother, can wait no longer. This is always my favorite blog post to write because I don’t have to search for words or experiences or stories to share as they seem to be just itching to come out and honestly, it is the one post that almost writes itself – directly from the heart. 31 years from the date when I first became a mom, my daughter, Emery, followed suit and gave birth to her first child. Besides the miracle of the 7.8 ounce beautiful bundle of boy that she brought into the world that night, it also feels like a bit of a miracle to me that we now share that very special anniversary of our entrance into motherhood and for that reason, I’m directing this blog post to Emery, in celebration of her first Mother’s Day. Welcome to the world of motherhood Emery Jane Golson. Your 7 pound 8.50 ounce beautiful bundle of baby boy not only added “Mom” to your list of names, but is also the miracle who will change everything in your life – from who you are to the way you view the world and everything you hold dear. On this Mother’s Day, your very first, take a moment to pause and honor yourself and the amazing journey you have begun. Although you earned your ranks into this holiday late into the evening on the 30th of April as you rolled 10 hours of labor into another 4 hours of pushing, your real entrance into motherhood began when you found out you were pregnant and I know you know that because of the tremendous care you gave to your growing belly. I remember my first Mother’s Day, 31 years ago, relishing the moment while cradling a 2 week old baby in one hand and a half-poured glass of champagne in the other. I was a brand spanking new, still wet behind the ears mom, stumbling through unshowered, sleep deprived days in stretched out maternity wear. As clumsy as my navigating in this new role was, it felt comfortable and right and nearly perfect – almost like I had always been there. Feedings at 1:00 a.m., and 2:00 a.m. and eventually so often throughout the night that the night became day and the day became night became my new normal, but none of that mattered because my life had already surrendered to the sweet face that would look up to me during those feedings. It was then, in those moments, that all in the world was right and perfect, even if it was 3:00 a.m. and I knew I’d be back in the same rocking chair, yet again, before sunrise. Those morsels of goodness, I learned, are often hidden in the most tiring, and trying and “oh no, not now”… times of day. When you understand that, you will understand biggest rewards of parenthood. I know you well enough to know that you will become a mom who will teach and lead from the heart and baby Arlo will be a better person for that. I was so determined to be the best mom I could that in those early weeks, I would thumb through stacks of parenting books while I nursed. Looking back, I wish one of those books I gave so much credence to, would have told me to stop, put the damn book down and simply savor the moment (but keep it on the shelf and resort to it when debating what next after sending said child to his/her room to think about what he/she had done. And by the way, that doesn’t work. If your child is anything like his grandma, he will only spend that time thinking about how to do it next time without getting caught). It took me a few weeks, but I eventually did put the books down and followed my intuitions, which led to many years of fun-loving, make it up as I go along, trust my gut and lead with my heart, parenting. You’re at an advantage. You are already there. 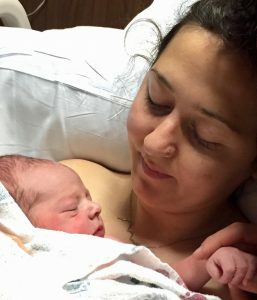 I can tell you a whole lot of things that will likely happen to you as a new mom because they are somewhat universal, but you soon will come up with your own unique list. Tears will flow, for no reason or for reasons that absolutely make no sense and you will have a tough time holding them in. That tear valve seems to open up shortly after you give birth and I’m sorry to say, sweetheart, but it will never close again, but that’s OK, because in its opening, you are able to feel life and love deeper than you ever imagined before and that is more than worth some extra tears. You will wake up more than the baby during your first several days at home, simply to check to see if he is still breathing and will feel relief when you feel his warm gentle breath on your hand. You will feel like an arm or a leg or some other vital part of you is missing if he is not tucked securely in your arms, and that, my dear new mama/daughter, is exactly what being a mom feels like. Whether your baby is still nestled into your arms, or 857 miles away, you will always remember the feeling of when you first held him in your arms, how whole and complete and absolute perfect that moment was. You’ve read my words more than once about my thoughts on the ever attached umbilical cord and even though you and your brothers are full grown adults, I still feel it. In my case, it has stretched itself across the country to 3 different states ( I think life has given me extensions to the cords I have, simply for ease). Even though you saw Arlo’s daddy cut his cord, believe me, it is still attached and there is some sort of comfort in that. No doubt you feel it very strongly now, just days after his birth, and I can tell you right now that although that feeling will wane, it will never go away. Ever. This day is yours now and in a bittersweet yet joyous moment, I feel like I’m handing over the keys to the car to you and now you’re the one that gets to drive. Make no mistake, I want to insure that there’s still room for me to hop on for the ride (I’ll ride in the back seat) and enjoy the journey with you, but you’re the driver now. You and Miles. You may have the keys, but don’t think that I’m tossing my mom card on the table with those keys as there’s still a whole lot of “sit up straight and eat your vegetables” in me… oh wait, you’re the one who tells me that. Never mind. But the mothering, my sweet daughter, will always be there for me although it will change and that’s OK and as it should be. No doubt, I will offer opinions, give advice that’s not solicited and more times than you care to count, I will tell you how I handled this or that or the other thing and how it was the best idea, the worst idea or it wasn’t even worth qualifying, and you can heed those words or ignore them, but know that regardless, they always will come from the heart. Once you cross over into the sacred ground of motherhood, everything changes and you realize that you are a part of something that feels far bigger than the labor you went through to get there. Many have come before you and many will follow and there’s a whole lot of “we’re all in this together” going on in the process of mothering. It truly does take a village to raise a child and although you and Miles are his parents, there will be countless souls who will help shape the person he will become. Even your sweet dogs, Leia and Olive and kitty, Regis, will have their roles. I’m speaking not only for myself here, but for so many other moms out there in saying, we’ve got your back. Reach out when you need us. I will always be your mother and you will always be my daughter, but now we’re entering into a whole new place given that we both are mothers now and that in and of itself is just about the most beautiful and perfect thing I can think of on this very first Mother’s Day for you. Into this gig just a handful of days and already I am marveling at the ease at which you have become a mom. Your maternal instincts kicked in far before those hormones did with your first labor pains. And speaking of labor pains… how appropriate of a word if there ever was one. You labored hard to bring Arlo into the world. This is the universe’s way of saying that this is no easy task that you have ahead of you and because of that, there is no painless entrance into your new role. 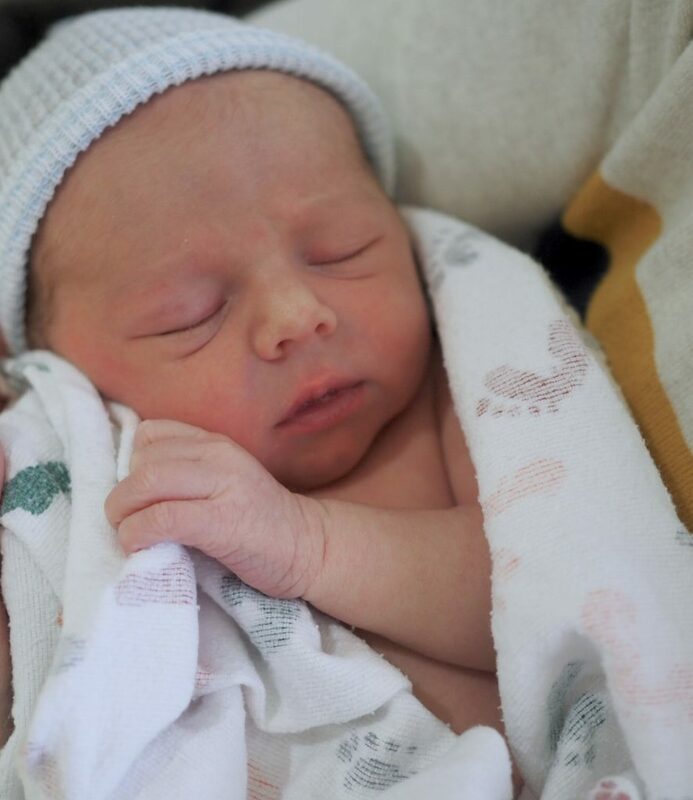 It’s not easy being a mom, but the 12 hours of raw pain you went through to bring Arlo into the world, is a pain that mothers will line up for two by two, time and time again, because of the incredible miracle that awaits them on the other side. Your journey will have its share of difficult days but the good ones will by far out number the bad ones. You will have days that you feel like you are swimming upstream in mud and it will be no easy stroke to maneuver yourself out of the mire, but you’ll figure it out and before you begin to physically slump into a human question mark, rest assured, dry land is never out of sight. Again, the goods outweigh the bads and that I can tell you with 100% certainty. You’ll stumble, you’ll fumble, you’ll eat a bag of chips with a salsa chaser for breakfast and will call pajamas clothes for more days than you care to admit and to that I say “do it.” And do it again, and again and again, because you deserve every morsel of not so healthy and every hour of long past time to get out of your jammies. You’re a mom now. Claim that right with pride. Life will change in ways you simply can’t predict and your own behaviors may surprise you. Case in point: I wore slippers more than once to the grocery store, and my comment to your “Seriously?? ?” comment was, “At least I didn’t wear my bathrobe…” I scrounged dinners, even with your friends over, out of the door side of the fridge, i.e., condiments, simply because I didn’t have another trip to the grocery store in me and what the heck, you were kids, you wouldn’t remember. Please tell me you don’t. I slept in sleeping bags in a closet with your two brothers, both under the age of 3 and tried my best to simulate a campout, while ducking under hangers of clothes, small as they were, but campouts didn’t usually have hangered clothes overhead. I let you skip preschool, multiple times, for field trips to wherever, while we ate cinnamon rolls bigger than our faces in the car, simply because it felt like the better idea. I walked your 5-year-old self countless times through my gardens, while teaching you the names of the flowering shrubs and perennials, in Latin, because you were curious and wanted to know. We made trips to the goat pen at the petting farm a regular part of our routine, where you would fearlessly walk into the pens and feed them as if they were your own. Now you live on a farm that has goats. I can’t tell you how much that tugs at my soul to see those seeds of my early parenting with you germinate so beautifully. THAT is what mothering is all about. I turned our dining room into a grocery store, a school, a doctors office, a veterinarian’s office, a construction sight and a craft station because who wants to risk eating over anything that’s not sponge moppable when you have kids under the age of 5, I mean 17, and what we did was more fun anyway than eating in the dining room. I let you kids go deeper into the baking bowels of my kitchen than I ever did with pretend baking with measuring cups, and spoons and flour and sugar and cheap spices making mixes that never amounted to anything because I knew before you started that your interest would wane long before the oven even preheated. I spent my after you went to bed evenings for 4 months in a closet building a Victorian doll house for you for Christmas but forgot to add the family who lived there so you were hardly impressed on Christmas morning, but I’d make one again in a heartbeat… this time, family included. This is the tip of the iceberg of memories, but it doesn’t end at childhood. In later years, when your children are old enough to have their own children, it is possible that when your first grandchild arrives, you just might show your waiter the lock screen on your phone, which of course will have the first picture of your new family, taken just hours after the birth of said grandchild, this of course before you even order. You may feel like you have his attention at that point and what you have to show him is far more important than your salmon salad order, which he likely will hear several times during his shift, easy on the dressing and skip the bread. This really and truly could happen. These are my stories but you’ll create countless stories and memories of your own, many out of pure desperation and mothering by the seat of your pants, but it will aways be the love that will stitch them together into memories you will cherish and laugh at and be embarrassed by, but above all, cherish. You grew up with a mom who often felt like that frazzled, wild haired bus driver in the Magic Schoolbus series, which I greeted at the time with a sigh and a promise to myself to get it right the next time, but now, decades later and without apologies, I realize that the messy, the dirty, the not wearing the right shoes, or shoes at all and letting go of a whole lot of shoulds and coulds just maybe was one of the best gifts I gave you. Already, just days into your new role as a mom, I’m seeing some of those seeds germinate and that makes me smile. I can’t end this letter without a big shout out to your partner in life and love, Miles. His hands on fathering melts my heart. What a lucky baby Arlo is to have you both as parents. From one mother to another, I wish you the very best of everything and several consecutive hours of sleep this Mother’s day, dear Emery. Only now that you are a Mom, can you begin to understand how much I love you. And I do. So much.